SALT Norfolk, the boutique luxury holiday lettings agency specialising in properties along North Norfolk’s perennially popular coast, has just added the prestigious Holkham Lodges, part of the Holkham Estate, to its portfolio, offering visitors the chance to stay within the estate’s extensive, 25,000-acre grounds. Comprising four, originally-styled, pet-friendly lodges, each sleeping two and unique to their individual setting and original purpose, guests will be treated to a bespoke welcome hamper packed full of local artisan goodies, seasoned logs to burn on the woodburning stove and complimentary continental breakfast for the first morning. Arguably the most iconic of the four lodges, the 18th century, Grade I listed Triumphal Arch was designed by renowned architect, William Kent, to impress travellers passing through to the North Norfolk coast. Modern-day guests will concur that he achieved his ambition, the arch presenting a striking welcome with beautiful panoramic views along the avenue to the south and north. A compact kitchen and cloakroom on the ground floor with stone, spiral staircase leading first to the shower room and then up to a separate toilet. Once at the top of the stairs you’ll be greeted by a truly welcoming, romantic space with roll-top bath, king size bed, open fire and comfortable seating – relax, put your feet up, unwind and dream. A truly elegant retreat. Price from £574 for a three-night short break or from £765 per week. Perhaps the most luxurious of all the lodges, this Grade ll listed gatehouse offers sumptuous fixtures and fittings in the parkland of the Holkham Estate. An enchanting and romantic setting, perfect for celebrating special occasions or simply escaping to a rural hideaway. Relax in the open plan living space with vaulted ceiling, cosy sofa and toasty woodburning stove. The true uniqueness is revealed in the subterranean level; once the vaulted cellars, but now featuring a glass atrium allowing you to appreciate the clear Norfolk skies – perfect for star-gazing. On this lower level you’ll find a snug TV room, the bedroom with a super king size bed, large walk-in shower room and separate bathroom with bath. It’s this property’s peaceful woodland location, in a tucked away pocket on the Golden Gates Drive which makes Palmer’s Folly the ultimate romantic getaway. It’s just you, your loved one and the Fallow Deer which graze the nearby parkland for company (unless you bring the dogs, too). This bijou ground floor studio offers a cosy, relaxing space with a woodburning stove to warm your toes after a long walk along the beautiful sandy beach flanking the estate. The Folly is a Grade ll listed gatehouse with comfortable furnishings and tasteful décor. Price from £643 for a three-night short break or from £857 per week. South Lodge dates back to 1847 and was designed by well-known architect, S. S. Teulon. Lovingly restored after some years of disrepair, the lodge once again stands as sentinel to Holkham Hall and The Triumphal Arch on the Holkham Estate. The perfect retreat for a wander down to the beach during the summer months or to cosy up inside by the wood burning stove during the cooler climes. Relaxing and switching off from the everyday is difficult to resist. If you’re feeling energetic, explore the far-reaching parkland that will be on your doorstep; ideal for long walks or cycling around the lake whilst the deer herd look on, with bike hire available on the Estate during Holkham’s visitor season. 10% off standard admission to Holkham Hall, the Field to Fork Experience and the Walled Garden during the visitor season from April to October. It is advised that visitors check details of opening times for each attraction at holkham.co.uk. There’s also good news for romantics – if they hurry. “As one of the most romantic retreats in the Norfolk holiday lettings market, it’s particularly timely that there’s still availability over Valentines Day weekend in some of the lodges,” she adds. 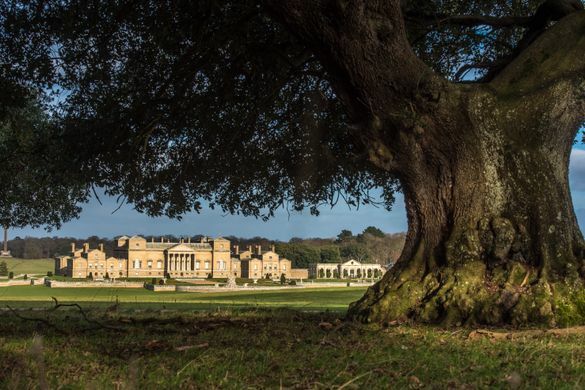 Holkham Hall sits proudly at the centre of the Holkham Estate and is surrounded by acres of historic parkland and woodland. The 18th century hall is one of the region’s finest and most recognisable Palladian country houses and the ancestral home of the Coke family for more than 400 years. The grounds are ideal for cycling and feature many themed walks and trails, with bike hire available. You can even take to the water on the lake during the warmer months of the year. Just outside the walls of Holkham Park is Lady Anne’s Drive which leads down to the wide-sweeping sands, pine woods and big skies of the Holkham National Nature Reserve and Beach, perfect to walk your four-legged friend. You will also find yourself spoilt for choice when looking to eat out. The Victoria Inn in Holkham village serves fantastic local, seasonal cuisine from dawn to dusk, whilst lunch can also be enjoyed at the Courtyard Café in Holkham park or the Beach Café slightly further afield in Wells-next-the-Sea. Wells-next-the-Sea is a charming coastal town with its iconic beach huts and picturesque harbour where you can enjoy fresh shell fish or the catch of the day. Other delights nearby are Burnham Market and its sister villages, Brancaster, Cley-next-the-Sea and the town of Holt to name just a few. SALT Norfolk was launched in 2017, specialising in luxury properties along the North Norfolk coast and up to five miles inland. With its head office in Holkham (and satellite offices in sister company, Norfolk Cottages’ Wells-next-the-Sea office), it is ideally placed to promote the prestigious Holkham Lodges to its clientele. Multi award-winning Norfolk Cottages is the largest, leading independent holiday lettings agency in Norfolk offering properties countywide and has been operating for over 27 years. It has offices in Reepham, Holt and Wells-next-the-Sea and remains the only exclusively family-run holiday lettings agency in Norfolk, offering unparalleled local knowledge to its 10,000 plus customers per year. In 2018, it was awarded the Feefo Gold Trust Award for the fifth year running.